There are so many ham enthusiasts in the world, whether it's people who enjoy it on special occasions or as a part of their usual diet. Regardless of how often you eat ham, there are special ways of caring for ham and ways to prepare it in order to keep the ham in perfect condition as time goes by. When we decide to invest in a nice piece of ham, we should keep in mind that there are specific ways to properly store it. Experts in the field have shared different tips and recommendations when it comes to consuming ham, as well as how to store the ham for a certain amount of time. Let's look at some of their suggestions in order to get the most out of the ham, lengthening its shelf life and maintaining its flavour and smell. According to experts, the conditions we should keep the ham in are similar to those of the curing cellar; that is, a cool and dry place. Changes in temperature can alter the organoleptic characteristics of the ham, including its texture and smell, therefore it is important to avoid these changes. It is recommended that the ham be kept at a temperature of between 10 and 15 degrees centigrade. Furthermore, you should avoid placing the ham near fryers, ovens and other cooking devices that generate heat. We must keep the ham away from sources of light that could directly hit it. Like many other food products, ham should be protected from sunlight. The ham, or slices of ham, should not be exposed or stored in places where there is direct sunlight since, just like with inadequate temperatures, this can lead to alterations in its flavour and colour. A cellar is an optimal place with the described properties for preserving ham. Recently sliced ham tastes better than ham that was sliced a few days ago. However, when you want to cut large quantities of ham, even whole pieces, it's best for the ham to be properly sliced by a professional and then vacuum-packed. This way we can help preserve its properties and it'll be easier and more practical to eat later on. In general, we recommend only slicing what you can eat in one sitting. Putting fat on the ham after slicing it is a very common practice. This is used to prevent the ham from coming in contact with the air and thereby delaying the surface from oxidising. The best thing to do is to cover the surface you've just cut with the white fat form the Iberian ham itself. This practice gives the ham a better image and prevents any unpleasant flavours and odours from being transferred to the ham. In addition, you should place a clean cotton cloth over the ham; this is the ideal way to preserve the ham when we're not going to be cutting it. Experts report that you should open the ham within the first two months after having bought it. In addition, the ham should be consumed within a maximum of one month after you've begun eating it. Where should we cut it? The cut of the ham must start from the leg and, once you've begun, the surface should be kept as uniform as possible in order to get the most out of the ham. There should be a method to your cutting. In addition, it's a good idea to maintain a uniform proportion of fat and lean meat in each slice; the ideal slice is three centimetres wide. You shouldn't cut the ham in several areas, as this makes it easier for the ham to dry out prematurely. 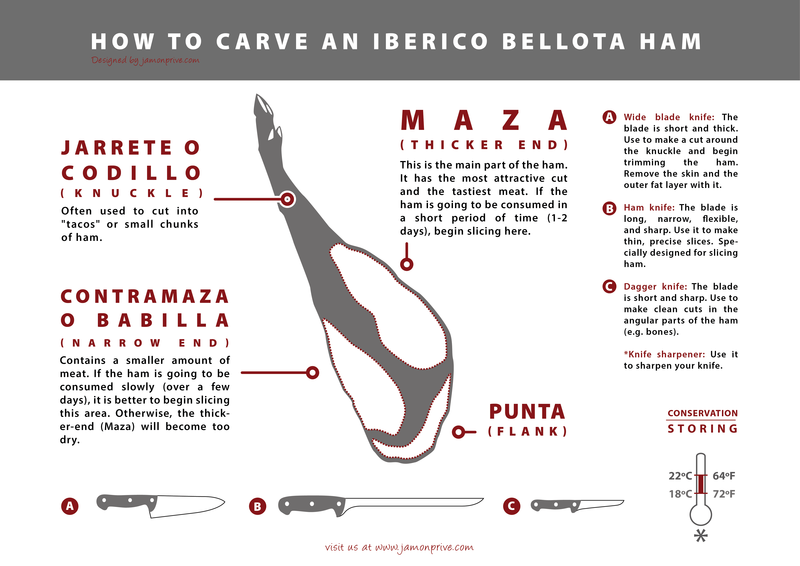 Professionals in the art of cutting ham use three knives: one long, strong knife to strip the ham and cut the outer part; a boning knife, called a pairing knife, to separate the lean meat from the bone in complicated areas; and the ham knife. This last one is thin, flexible and long, especially designed to achieve thin, perfect slices. Additionally, they use a sharpening tool to sharpen the knives and keep them in tip top cutting condition. The ham should not be wrapped, we need to remember that it's an organic product, it's alive. By wrapping the ham, we are depriving it of the ability to breathe and sweat, and we only manage to diminish its quality. When you buy a piece of ham, it's a good idea to remove all wrapping that it comes with and to hang it in a cool, dry place where it can breathe. Plastic wrappings and other materials should be avoided because they can favour the appearance of unpleasant flavours and smells that range from rancid to humid. When cutting the whole piece, it's a good idea to vacuum pack it in plastic bags and in portions of approximately 100 grams, which are customary for consumption. If you are going to eat it within a few hours or days, it can be kept at a temperature of between 10 to 15º, without the need to refrigerate it. If we aren't going to consume it for a long time, it's best to keep it refrigerated in order to delay the oxidation of fats and prolong the ham's shelf life. You should remove the refrigerated packets of ham half an hour before consuming them; this will allow it to reach the optimum temperature for consumption. 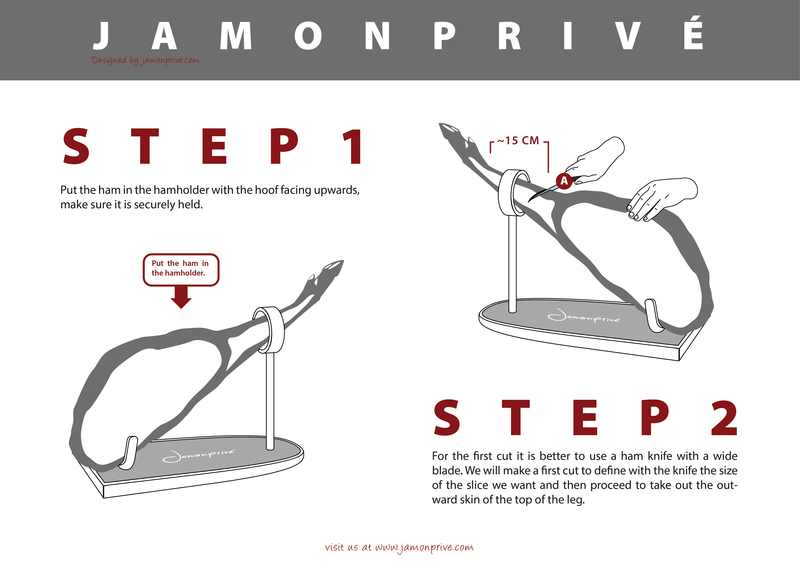 After half an hour, you should open the package and place the slices on a plate to air out the ham before you enjoy it. Once you've reviewed this set of recommendations for preserving and storing ham, you'll be able to prolong the product's shelf-life, managing to maintain its smell, taste and texture for even longer.